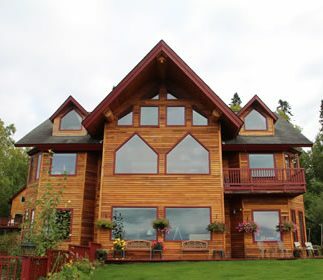 Situated on the tip of a small bluff just five miles from Downtown Talkeetna, The Denali Overlook Inn is one of the most spectacular BNB’s in all of Alaska. Our northern viewshed is dominated by Denali National Park and Preserve with unobscured views (weather permitting) of Mount Denali, Mount Foraker and Mount Hunter. Even the locals remark that the Inn has one of the best views in the area of the high, glaciated peaks that make up the “roof of the continent”. The Denali Overlook Inn was designed to be as spectacular inside as the view on the outside. It features a stunning Great Room which spans fifty-two feet across and is accentuated by ten foot ceilings, a wall of windows overlooking the mountains, open archways and a cozy wood burning fireplace. The lodge also features an outdoor deck and lawn that face the Alaska Range. We have an incredibly scenic fire pit and provide complimentary s’mores makings for you and your family! The Denali Overlook Inn is open year round and features outstanding views of the Aurora Borealis (Northern Lights) right from the Great Room or even your bed (late fall and winter)! Talkeetna is a quiet place in the winter, but has amazing access to cross country skiing, snow machining and snow shoeing. Come see us in the slow-season to enjoy an extra helping of solitude and discounted rates! Driving directions to the Denali Overlook Inn can be found here.